You must re-use your existing cabling and hardware. Dimensions: Length:10.21", Width:6.60", Height 8.03"
Non-spillable Sealed construction for operation in any position except upside down Wide operating temperature range High discharge rates and low self discharge rates High impact resistant plastic case 112 minute reserve capacity Safe for Surface, Maritime and Air Transport PowerStar brand 2 year warranty. PowerStar™ Brand Power Accessories Powering your World 100% compatible, 2 year warranty, PowerStar Brand, meets or exceeds OEM specifications. 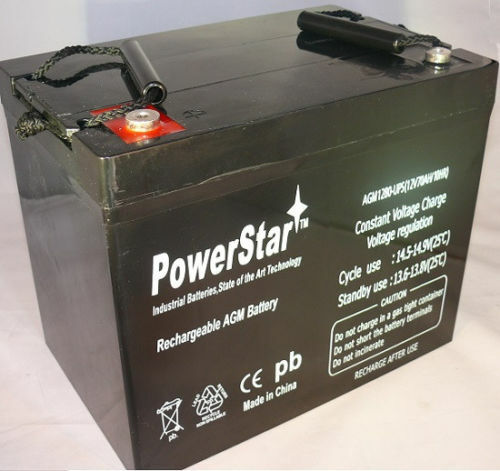 All PowerStar Brand Batteries are produced with high quality cells and materials. Beware of imitations, make sure you are purchasing authentic PowerStar Brand trademarked batteries and accessories.